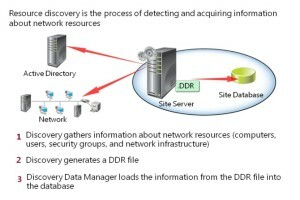 This post by David Papkin Managing the Configuration Manager Client Agent in SCCM 2012 R2. You can install the System Center 2012 R2 Configuration Manager client agent software on devices such as workstations, laptops, servers, and mobile devices. Then, you can manage these devices and perform operations such as reporting hardware and software inventory information, installing software, and configuring settings required for compliance. 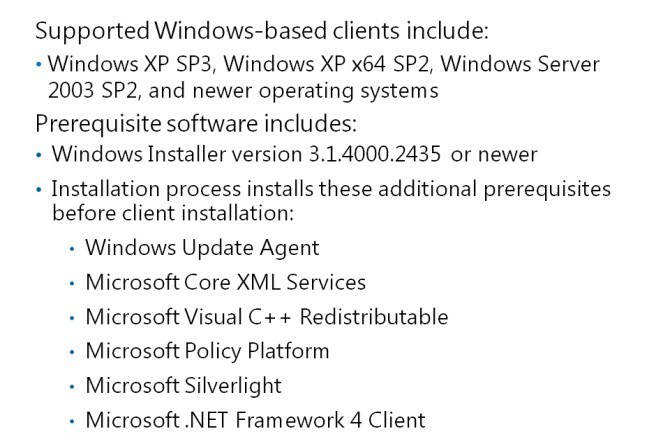 Configuration Manager provides several options for installing the client software. What Is the Configuration Manager Client Agent? Control Panel items. In Configuration Manager 2012, the UI for the Configuration Manager client agent consists of two parts: the Configuration Manager Control Panel item and Software Center. The Configuration Manager client agent consists of many components or agents that are running in the background, which perform tasks based on the site configuration and policy. can search a network for resources that you can use and manage with Configuration Manager. operating systems. Configuration Manager 2012 also supports client computers that are running the Mac operating system (Mac OS X), Linux, and UNIX. 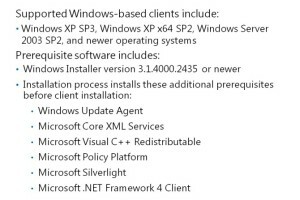 The following table lists the additional software prerequisites that certain features require. This concludes this post by David Papkin Managing the Configuration Manager Client Agent in SCCM 2012 R2.